Be the first to share your favorite memory, photo or story of Aleta. This memorial page is dedicated for family, friends and future generations to celebrate the life of their loved one. 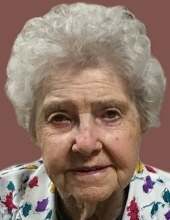 Aleta Belle Cohrs, age 96, passed away February 3, 2019 at Bethany Lutheran Home, where she has lived the past 10 years. Aleta was born October 18 1922 in McClelland, Iowa to the late Joseph and Mary (Gardner) Mathias and graduated from Underwood High School. She was united in marriage to Donald Cohrs who passed away July 11, 1969. Aleta was a homemaker and from 1969-1981 worked at Jennie Edmundson Hospital in the Medical Records. She was a member of the former Glendale Church. Aleta is preceded in death by her parents; husband; sisters, Fern Lapsley, Mary Scott, and Eileen Oltmans; brothers, Charles and Bud Mathias. Survivors include daughter, Donna O’Connor and husband, Tom of Council Bluffs; son, Ken Cohrs and wife, Sally of Oakland, Iowa; grandchildren, Shannon (Marc) Allen of Sioux Falls South Dakota, Tommy (Seanna) O’Connor of Council Bluffs, Mitch (Jewell) Cohrs of Centerville, Iowa, Brad (Lindsay) Cohrs of Lunenburg, Massachusetts: 5 great-grandchildren, Meara O’Connor, Kylie and Sean Allen, Samantha and Basil Cohrs; sisters, Zella Duchman of Council Bluffs, Lois Beaver of Chesterfield Virginia; many nieces and nephews. To send flowers or a remembrance gift to the family of Aleta Belle Cohrs, please visit our Tribute Store. Luncheon at the Walnut Hill Reception Center following interment. "Email Address" would like to share the life celebration of Aleta Belle Cohrs. Click on the "link" to go to share a favorite memory or leave a condolence message for the family.